Measles cases in the Swansea epidemic have risen by 20 in the last five days to 1,094 as health chiefs warn the uptake of MMR is too low to eliminate the disease in Wales. Public Health Wales (PHW) continues to warn that the outbreak may spread. It said 95% uptake of MMR would prevent further outbreaks. But vaccination rates remained low in Wales, especially among those aged 10 to 18 who are hardest hit. In total, 1,257 people across Wales have now contracted the disease since last November, as the latest figures were released. 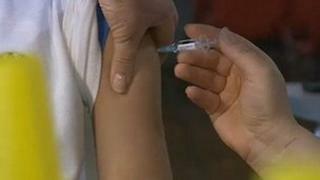 PHW said more than 43,000 non-routine MMR vaccines had been given since the outbreak began. It said it was still concerned about a possible future outbreak in the old Gwent area, where 84 measles cases had been reported since November. In the seven days up to last Thursday, 201 children aged between 10 and 19 had received the MMR vaccine in the old Gwent county - leaving around 10,000 children still vulnerable to measles. In the whole of Wales, PHW said 823 people aged between 10 and 18 received MMR in the same period. Meanwhile, it said only 381 people turned up at drop-in clinics in the Abertawe Bro Morgannwg University Health Board area on Saturday, fewer than a quarter of the numbers seen on previous weekends. Dr Marion Lyons, director of health protection for PHW, said: "I am concerned there may be a perception that because the number of new cases we are seeing each day in this outbreak is slowing, the threat of measles is going away. This is not the case. "In 2011 we had only 19 cases of measles in Wales all year and that should be compared with the 20 new cases we have seen since the end of the last week alone. "The 84 cases in Gwent are a huge concern to us and with 10,000 children there still in need of vaccination, we are warning young people and parents not to be complacent just because they don't live in the outbreak area. "The message is simple - measles is highly contagious and it's everywhere in Wales. If you haven't received two doses of the MMR vaccine, you are at risk from a disease that can be highly dangerous." Four drop-in clinics will be held at Singleton and Morriston hospitals in Swansea, the Princess of Wales Hospital in Bridgend and Neath Port Talbot Hospital on Saturday between 10:00 and 16:00 BST. Aneurin Bevan Health Board is also holding a clinic between 11:00 and 15:00 BST on the same day at the outpatients department of the Royal Gwent Hospital, Newport. No appointment is necessary but babies under 12 months old cannot be vaccinated.